The Chinese-developed underwater robot "Tansuo" conducted its maiden test dive in the South China Sea Monday. China's self-developed underwater robot is prepared to dive during its first experimental operation in the South China Sea on July 24, 2017. It is expected to stay underwater for 20 hours. The robot is 3.5 meters long and 1.5 meters wide and can dive to a depth of 4,500 meters. It will conduct 20 hours of collaborative operations with the unmanned submersible "Faxian" in the South China Sea. Chinese research vessel "Kexue" left the port of Xiamen in eastern China's Fujian Province Sunday to continue its scientific expedition in the South China Sea. 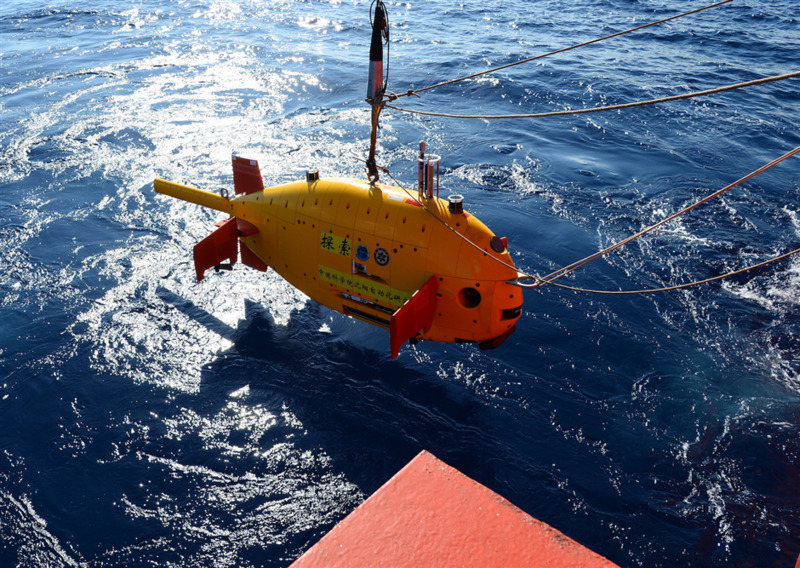 During the second stage of its mission, the unmanned submersible will carry a domestically-developed device, a raman spectrometer, to measure marine physical and chemical parameters and take camera images of benthos organisms. The Kexue left Qingdao in eastern China's Shandong Province on July 10 for a maritime scientific expedition and stopped in Xiamen to resupply Friday after completing the first part of the mission. In the first stage, a total of 12 Chinese-developed underwater gliders carried out scientific observations in the South China Sea, sending back real-time data. It was the largest group of gliders to perform simultaneous observations in the region.